Preheat oven to 450°F, with racks in upper and lower thirds. On a rimmed baking sheet, toss rhubarb with honey. Roast on upper rack until beginning to soften, about 5 minutes. Let cool on baking sheet. On another rimmed baking sheet, toast walnuts on lower rack until fragrant, 5 minutes. Let cool, then chop. Fiber—one of its foremost health hallmarks, which is one reason the Chinese use it for soothing stomach and digestion issues; it also makes an effective poultice for relieving fevers and swelling. Vitamin K—every serving provides 45% of the daily value required; this means rhubarb supports healthy bone growth and can limit neuronal damage in the brain (even to the point of Alzheimer’s prevention). Vitamin C—it’s very high in this vitamin. Vitamin A—it’s also very high in this vitamin, and together with vitamin C, it has been proven to protect against lung and mouth cancers. 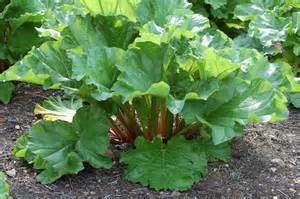 In fact, a serving of rhubarb contains at least 32% of the daily value in manganese, iron, potassium, and phosphorus. And while many believe milk is the best calcium source, one cup of cooked rhubarb contains just as much, and it's actually much better for you. 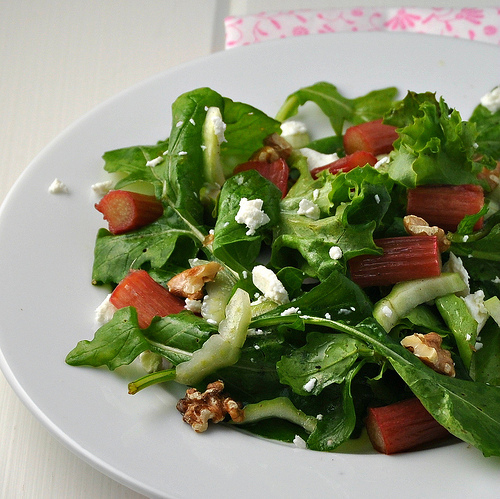 In fact, rhubarb is on the short list with salmon and spinach for the highest amounts of bio-available calcium. One way to use less sugar is to add a seasoning such as orange peel. 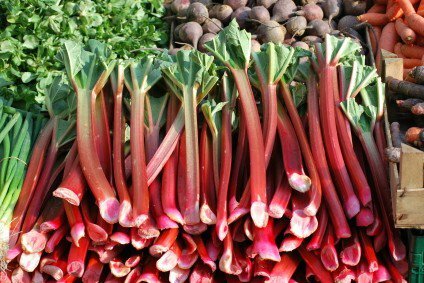 This makes the flavor more complex, and lessens the impact of the rhubarb's natural tartness. For instance, one can use 1 quart of chopped rhubarb (about 1 pound), 1-1/2 teaspoons of dried orange peel, and only 1/4 cup of sugar or honey. Besides honey, other good sugar substitutes are pure maple syrup, agave syrup, or rice syrup. Professional chefs advocate using honey or syrups—it’s their secret to rhubarb success! Another professional chef secret is to substitute the water a recipe calls for with orange juice. They also throw in a spliced vanilla pod. Spices are also often added. The seasoning really depends on the tastes that you like the most, and how much of the rhubarb flavor you want to cover up. And don’t be tempted to increase the amount of sweetener called for. Only use the amount the recipe specifies, even if you have a very sweet tooth. Many chefs report they use only half the amount and the end result is still delicious. Trust the pros. Cooked rhubarb freezes well, and it can also be processed in a hot water bath. Have scalded jars and rings ready. 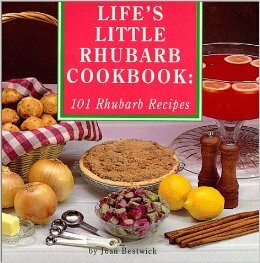 Bring the rhubarb mixture to a boil, fill your jars, and process them in a hot water bath for 15 minutes. Let’s close this rhubarb talk with a nod to the traditional way of eating it—as a custard (which makes an excellent breakfast dish, by the way). 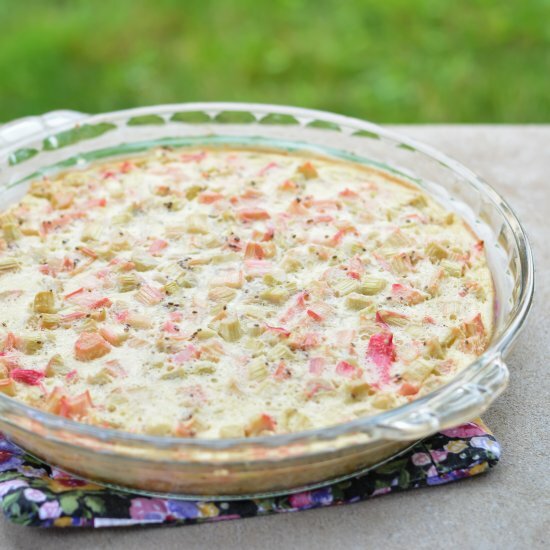 Aunt Annie was famous for her garden and her rhubarb custard, which she would serve in small dishes or often in a pie shell and topped with sweetened whipped cream. This was one of our favorite seasonal treats! Toss the rhubarb with ½ cup honey and the orange zest and juice until well combined. Transfer to an oven-safe, well-buttered baking dish or individual buttered ramekins, and spread rhubarb to form an even layer. Whisk the eggs with the cream, flour, and remaining ¼ cup honey until smooth; pour over the rhubarb. Bake until custard is lightly browned, puffed, and no longer wet in the center, about 1 hour 15 minutes. Cool completely on a wire rack. TIP: You can make this custard the day before and chill overnight in the fridge.